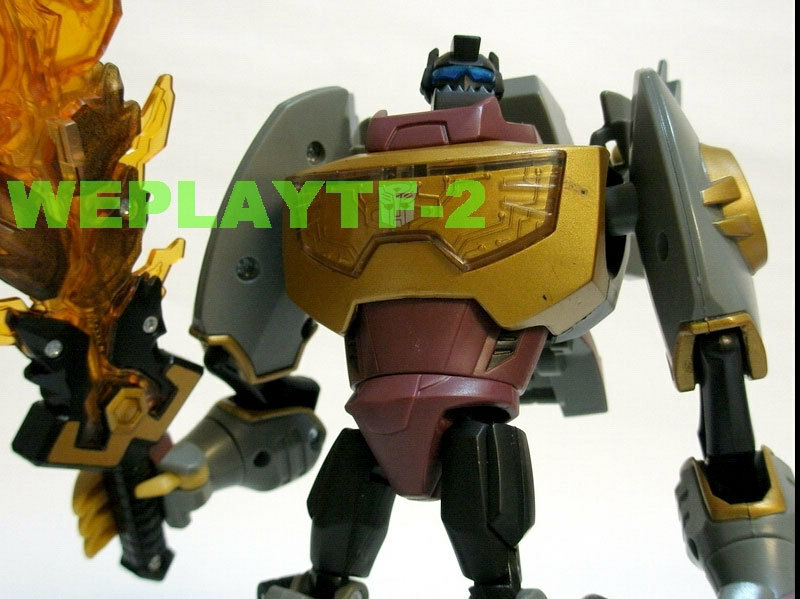 Peaugh comes through once again with new images of the highly anticipated Transformers Animated Autobot Grimlock toy. 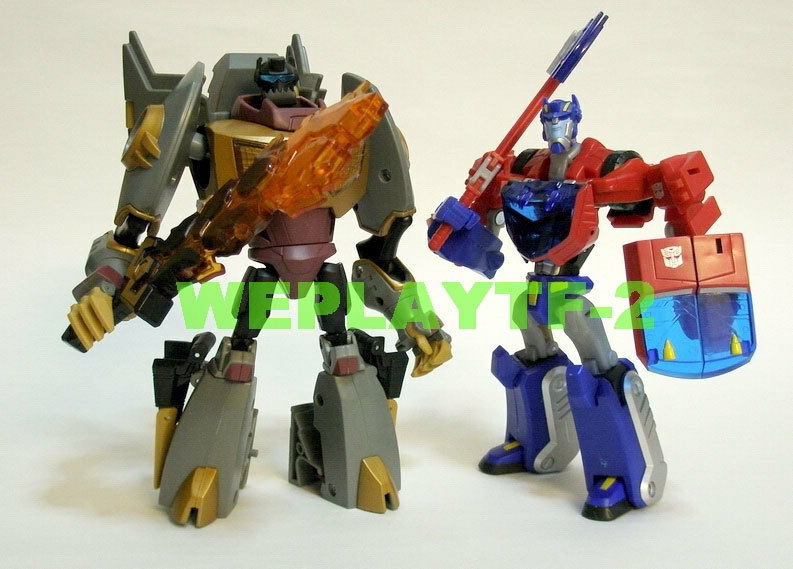 These high quality images give a great look of this toy as well as show a size comparison with the deluxe version of Transformers Animated Optimus Prime. Well anywhoooz. I'm not paying extra for early release ebay figs, so the wait for all this Animated goodness is getting rough. 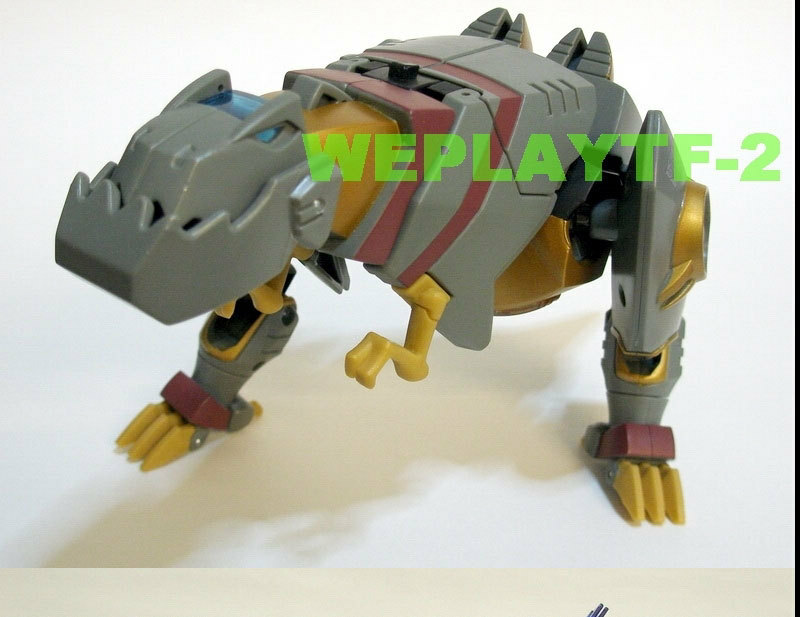 And to be fair… it's about damn time we got a Grimlock in a larger-than-deluxe scale. That detail right there, is possibly the best thing about this Grimlock toy. Second only to the fact that it's GRIMLOCK. OH, no no no, I wasn't trying to slam you at all. I REALLY appreciated your post. But I'm trying to laugh at the whole mess and take it in stride. It's really not worth getting all boiled up over. And I *AM* married to an English teacher, so if my grammar is bad, I probably shouldn't let her see the videos. As I said in my pm, I'm sorry. I've been on flu medication for the past 6 days, so my heads a little off at the moment. Re-reading my post, I'm actually surprised it's coherent, and I probably should have put "use of words" instead of grammar, as that's what I was specifically talking about, lol. Back onto the topic, I find it a little sirprising that his legs not only come from the tail and back end of the dino-mode, but also share a part of the upper/mid back of the dino-mode. 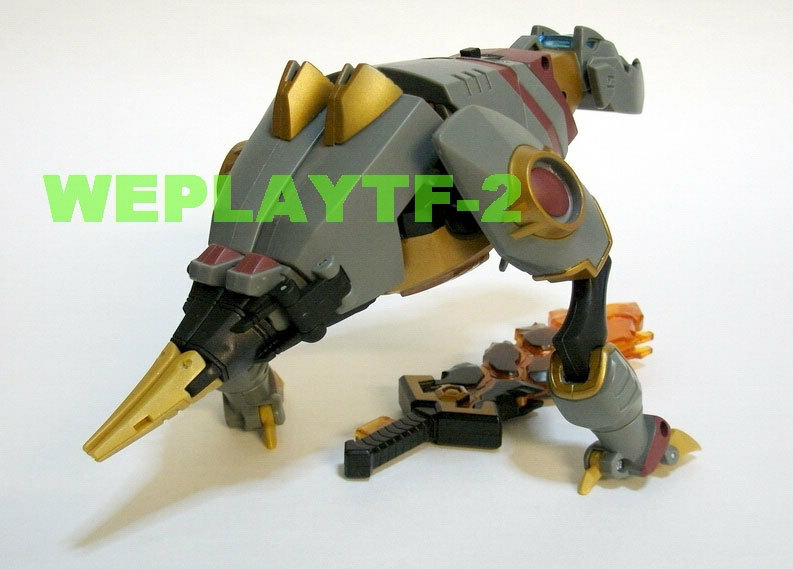 It's nice to see that the dino-arms fold in too, as they would look a little odd sticking out in bot-mode. 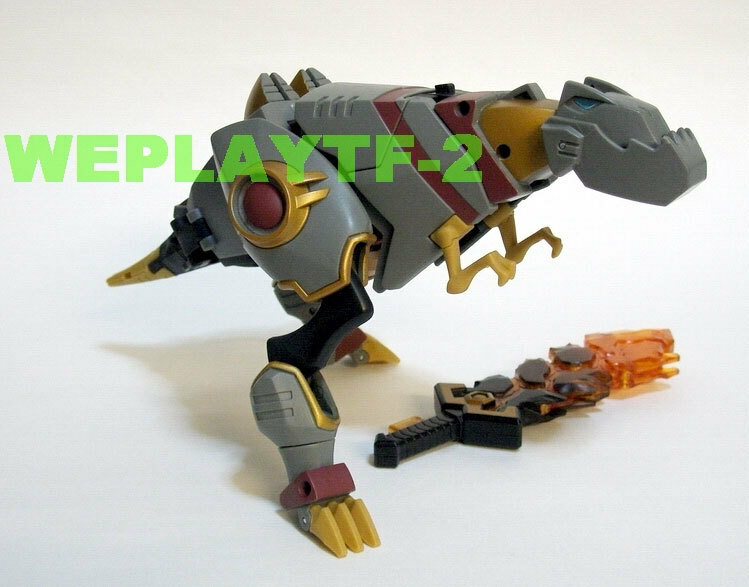 Now all we need to see is a Swoop prototype and we've seen the whole Dinobot team. I think Grimlock's rash emotionalism is leaking out into this thread and infecting everyone. Know what I mean? What!? Are ya STOOPID!?!?!?1?! RARR!!! I know you're joking, but…wow…trying to help and defend someone to have them comment to your post like that isn't helping anything. Er… all he's doing is joking that he's married to an English teacher, so hopefully his grammar isn't too bad. I don't think you have any reason to feel slammed for coming to his defense. As for sizes… in some cases, Hasbro is cheaping out. Overall it seems like the size of the various price points has been getting smaller, gradually. Now, I know that plastic is more expensive, the engineering just keeps getting better, etc, etc… but standing a Classics Rodimus next to an Armada Wheeljack… or even a Bendy Prime, is sort of depressing, y'know? In Animated, the sizes are all over the place, with Bumblebee standing a head over Voyager Bulkhead, and Dlx Lockdown being the tallest figure in the line so far. However, while functionally, a "fat" figure like Bulkhead may contain as much mass as a Starscream or Optimus, his tiny scale just detracts from his presence, and also clashes with the other figures in the line (fortunately they've made a Leader Bulkhead, so that's been rectified for the most part). Here in Canada, a Voyager runs you $30… so it's nice to have a figure that feels more substantial than a Deluxe. Weight is only part of that. But then, obviously some people take issue with that, and others don't. Initially Grimlock seemed a little small…but once I looked a little more carefully to how he stacks up to others in the line, it seems like he might be alright after all. 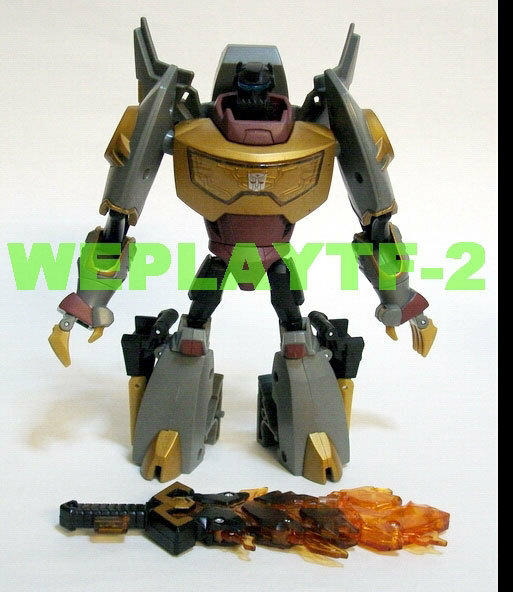 Grimlock looks awesome. A little shorter than I would love him to be, but he's another one wheren his bulk definetly makes up for it. Honestly, I'm really getting tired of people basing size class instantly off of how tall a TF is. It isn't that at all. It's over all size, the engineering that when into it, and how much plastic it takes to make that TF. That is why we're getting a short Bulkhead and Lugnut (Grimlock here is about average size for a Voyager), and not Hasbro "getting cheap with us" or anything like that. As for the whole review/overview debate….does it really matter? IMO, no, it doesn't. I'm happy enough that he's been providing us with pictures and what not, withought feeling the need to correct his grammar, and then bug him about it every chance I get. Thanks Peaugh. damn you hasbro and your awesome R&D department. I wasn't planning on getting any Animated figures, but your pics have gotten me interested in Grimmy. I can't wait to see the video REVIEW. Dayyyamn. 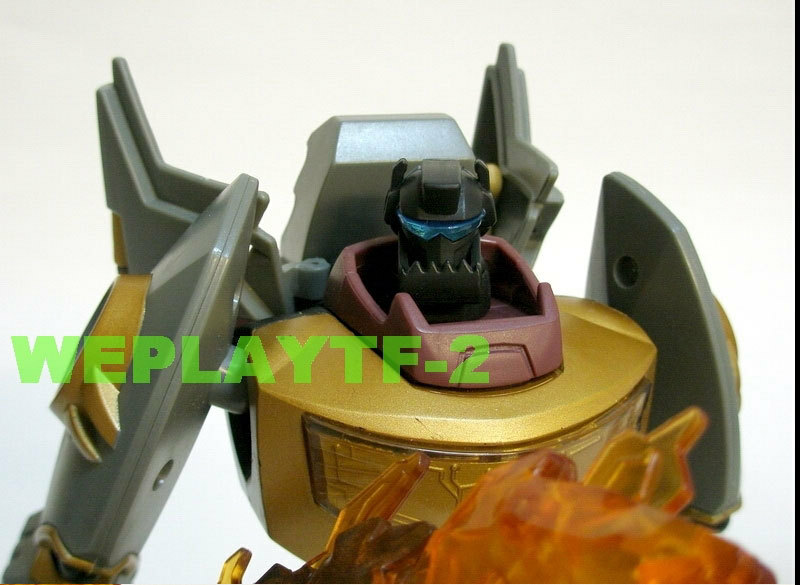 Hello there, new Classics Grimlock! Love the pics, love the look of this one. Looks like there's definitely some Animated figures I can't pass up under any circumstances. Peaugh, if you get the opportunity, any chance we could see some Grimlock comparisons (G1, Classics, Energon, etc)? Whatever you got would be much appreciated. It seems to me you have been criticising him. I even seem to remember the overview comment on another of his threads. Leave the guy alone. He's the only person on TFW thats done a review with some great pictures and good videos. Get off his back. Any way, rant over, does his Alt Mode jaw open? Guys, seriously, can we cool it on the review. I think we all know where we stand on the issue, and as I mentioned in the Voyager Op feedback thread, it's not glitcher's advice that I have a problem with, it's the repetition when I haven't even had an opportunity to put it to use. Dragging it out just makes it take longer to be over and done with. I don't want to deal with it, I've already gone through enough crap today. I couldn't agree more. Thankfully, all I've been doing is offering ways to improve Peaugh's. He doesn't seem like an open-minded type, though. Unsolicited critique on the internet is always a delicate affair. ALWAYS. That's why it's generally seen as poor form to even attempt it. So it should come as no surprise that people are rubbed the wrong way by some comments. Hey! Nice "review", though since you don't go into much detail I'd say it's an overview more than a full review. Would you be interested in some advice I think would help you improve your videos? That's an overview. Not a review. Don't you mean an overview. And then offer the advice. If you wanted to give him input to improve things… there is a PM button. a PM of helpful advice is much better than tearing down someone's reviews publicly in their own thread under the umbrella of 'advice'. ….. said the man who responds to a sincere post with more sneering. Besides, I already answered your question in my last post. No, KA was being to the point. Okay, he was sneering a bit too, but he was being succinct. Secondly, there is something in your manner when you make your comments that puts people off… a sense of entitlement perhaps? I imagine it's unintentional, but it's something to be wary of. The fact that you often only seem to offer criticism on people's art, and every other minor bit of forum officiata (heh, I just made that word up), only makes it worse. In my case, for example, I didn't comment just because of your interjections in this thread, but after seeing you making incidental critiques in a number of other threads over time. It finally just got to me. Anyway, there's a sincere response for you. I hope you take it to heart and take a moment to re-examine how your approach might not always be appropriate, rather than it merely being a case of everyone else being thin-skinned. well, not bad. all in my expection actually.